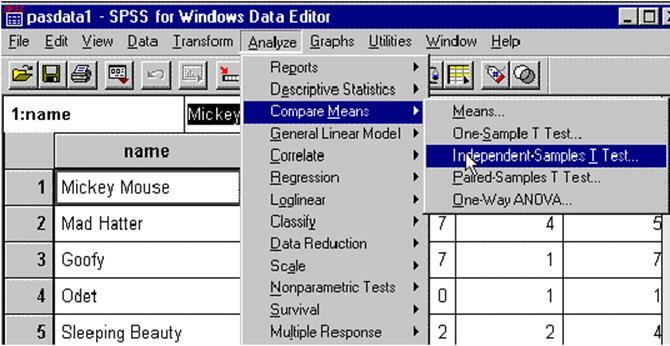 The SPSS package has many options and, consequently, there is more than one way to perform an analysis. In fact, there are so many options that it can be confusing. Two different methods of creating a Syntax File (Job Stream) and running the analysis are presented. The commands that make up the Syntax File can be typed into the file using a text editor or the commands can be created by clicking the mouse on various window selections and the results can be saved to a Syntax File. The example presented above uses the method of typing in the commands. In the next example, the analysis will be performed by clicking on various commands. 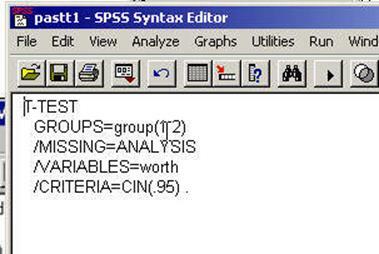 Further, the commands will be saved in a SPSS Syntax file like the one above. The analysis can be run without saving the syntax to a file. For the purposes of this course, you should always save the commands to a Job Stream (Syntax File). There are at least two good reasons for saving the commands: (1) you have a record of what you did, and (2) when you need to re-run the analysis (or when you need it a year later) it can be rerun with the click of the mouse. Click on box in the upper left hand corner of the Syntax window (as indicated by the arrow) and when the next window appears click on "Close." How to Open SPSS click here. In that sample data set there are some cartoon characters that are animal (i.e., Mickey Mouse and the Road Runner) and some cartoon characters that are human (i.e., the Mad Hatter and Cinderella). 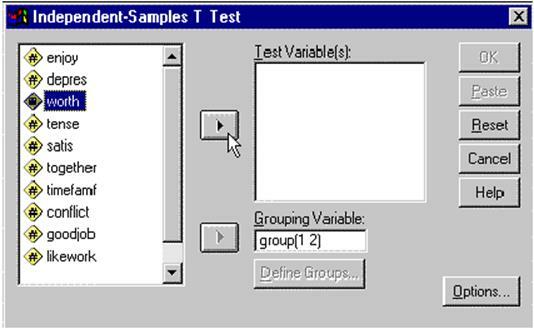 In this example a t-test will be computed comparing "animals" to "humans" on the item of whether in they felt like they had "spent worthwhile days." When you click "Analyze" in the above Window and the pull down menu below appears. Move the cursor over Compare Means and a second pull down menu appears. 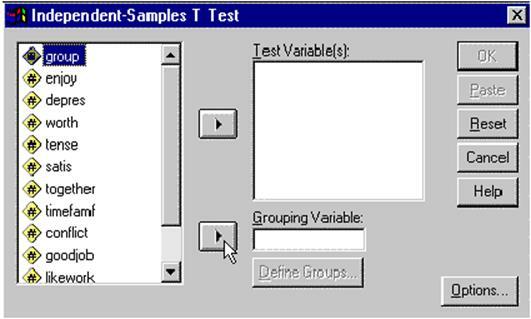 Click on Independent-Sample T-Test and the following window appears. 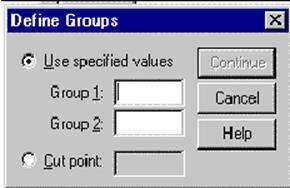 Click on Define Groups and the following window appears. Enter a 1 for Group 1 and a 2 for Group 2 and press Continue. 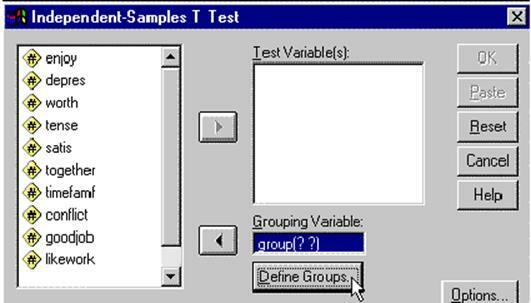 Click Paste and the Syntax window appears along with the syntax for running the T-Test. One more step to go. Add the data file name. Enter file name--including drive and subdirectory. The "get file==e:/dape/pasdata1.sav" is not created by the computer and must be entered by typing it into the file. 3. 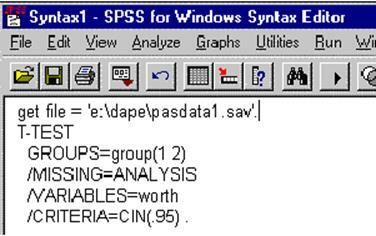 Click on "Save SPSS Syntax"
4. Enter the desired name of the Syntax file (in this case "e:/dape/padtt1.sps"--yours should be different) in the "File Name" box. For a detailed description of saving a syntax file click here. To run the program (Execute the Program or Submit the Program for Analysis). For detailed description of submitting a program and other methods of submitting a program click here.